← Should I Spend Donuts on the Waterslide Tree? So a new element was introduced to TSTO with the launch of the Time Travel Toaster Event….The Vault! Let’s explore this Donut Vault, what you can expect from it and what dates items are set to change out…. The Vault is a location in your TSTO Store where certain premium items will now be stored, and when they appear in the vault (for a limited time) they appear at a discount, well donut rebate. So basically items that always appear in the store (Premium Items) like the Knight Boat, Fiddler, the Whale, etc have been pulled from their store categories and placed in The Vault. Items will rotate in and out of the vault at varies times, so you’ll have to check it out often to see what’s inside. 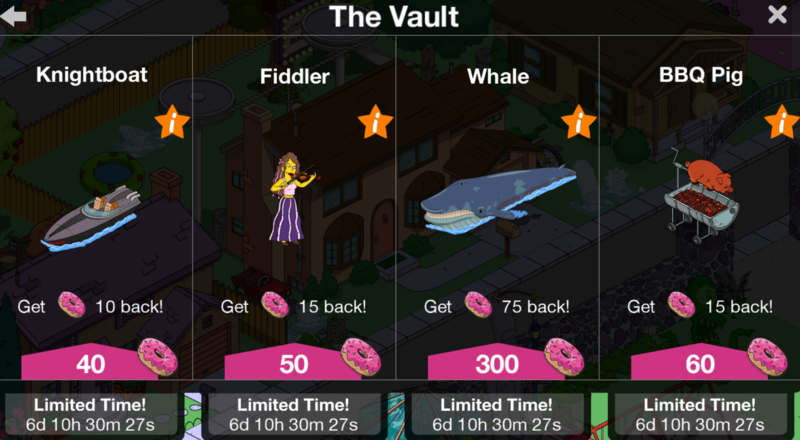 You’ll see items all offered with a rebate (even the Whale, but I’m still not buying one..you can’t get me EA!) and a timer. It appears that the items will remain in the store for a week, resetting every week. Currently the files show an Vault End Date of September 12th. So it looks like they’ll be around for the summer at least. I do not know what will happen when September 12th hits though. Not sure if they’ll go back to how they were before the Vault, if EA will launch another Vault round or if they’ll disappear all together. We’ll all have to find out together…. First, let me start with everyone’s Vault will like vary. It’ll depend on what premium items you have in your town…so don’t panic if your neighbor’s is different than yours. All items will appear at some point. Whew! And that concludes everything listed in the Vault! Once again, I have no idea when these particular items will appear in your store specifically. The items will rotate out each week, and everyone’s store will be different. So just keep an eye on The Vault to see what’s in there and what’s new! What are your thoughts on the Vault? A lot of items you think you’ll be picking up? Sound off in the comments below, you know we love hearing from you! 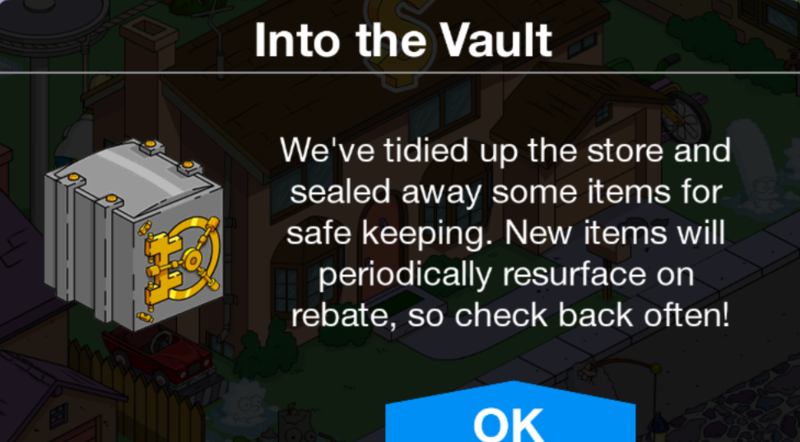 This entry was posted in Donuts, Tips and Tricks, Updates and tagged Premium item Vault, Should I Buy Items From the Vault?, Tapped Out Tips and Tricks, The Simpsons Tapped Out, TSTO Addicts, TSTO Donut Vault, TSTO Time Travel Event, TSTO Tips and Tricks, TSTO Vault, What Is the TSTO Vault, What's in the Vault, When Do Items Change in the Vault. Bookmark the permalink. I got the observatory in my vault today, but it’s not discounted, it’s still 75 donuts with no rebate. I didn’t know that happen in the vault, is it a glitch? What about the premium characters like Boobarella etc? Are these a one time deal or will we have the chance to collect all characters in the future? They often come back during events or Black Friday sales. Got coach Krupt in my vault this week. I’m new player lvl 55, i’m wondering if I jump on it or if I wait for Dr Nick or Franck Grimes. I really want those two last ! The Springfield Observatory appeared in my Vault today. However, it is listed as 75 donuts and no donut rebate. Is there a reason for it? I am very interested in the building — but 55 donuts would be a much better price. My vault this week is Dr. Nick, Arnie Pye, the French Waiter and the Duff Party Liner. I want to buy all of them, but I’m also close to pulling the trigger on the Sorcerer Frink bundle since I don’t have Frink. Too many things demanding my sprinkles, dang it. If y’all had to pick only one or two, what would you go for? Dr. Nick almost seems like a must.